OUR SNEAKERS HAVE BEEN MANUFACTURED IN THE RUBBER FACTORIES IN KURUME CITY, FUKUOKA. IT IS FOUND THAT, WHEN LOOKING INTO THE HISTORY FURTHER, THESE OLD RUBBER FACTORIES HAD ALREADY EXPANDED OVERSEAS SUCH AS AMERICA AND CANADA BY THE 1960S DUE TO THEIR ADVANCED SNEAKER PRODUCTION SKILLS, AND ALSO DOMESTICALLY, THEY WERE MANUFACTURING CANVAS SHOES OF IVY STYLE BRANDS, WHICH WERE POPULAR AT THAT TIME. THERE WAS A PAIR OF SOCKS WIDELY FAVORED BY THE SAME GENERATION. 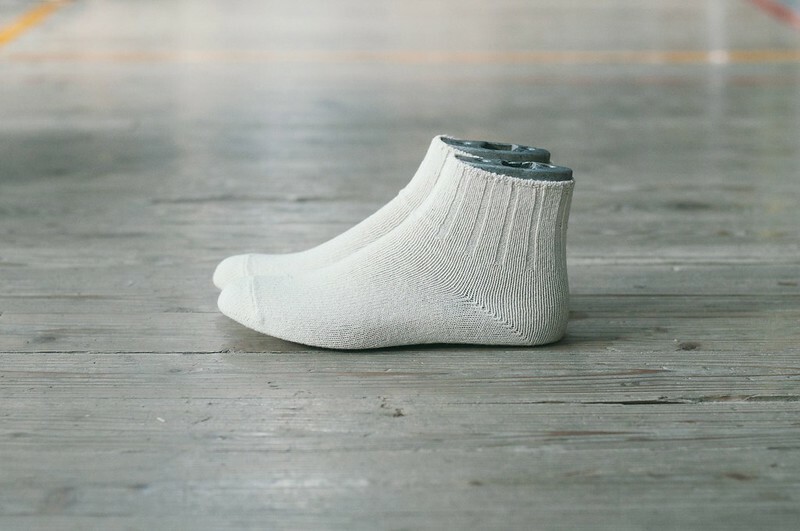 A TRADITIONAL SOCKS BRAND THAT WAS STARTED IN THE 1966, "HALISON," WAS ESTABLISHED AS A BRAND MANUFACTURED IN-HOUSE SOCKS FACTORY OF KUBOTA CORPORATION ESTABLISHED BY KUBOTA KITTING MILL (CURRENT KUBOTA CORPORATION) IN 1925 IN HARIMA AREA (KAKOGAWA CITY, HYOGO). "HALISON" MARKS THE 50TH ANNIVERSARY THIS YEAR. THE HALISON SOCKS WERE ALSO CHOSEN FOR THE IVY STYLE AT THAT TIME. ARGYLE SOCKS AND CREW SOCKS WERE THE MAINSTREAM STYLES BACK THEN, BUT EVEN NOW "HALISON" REMAINS POPULAR AS A BRAND THAT IS KNOWN TO THOSE IN THE KNOW. ALSO, IN THEIR IN-HOUSE FACTORY, OEM PRODUCTIONS FOR MANY PRESTIGIOUS BRANDS HAVE BEEN DONE AND THE HIGH QUALITY IS KNOWN TO BE GUARANTEED. 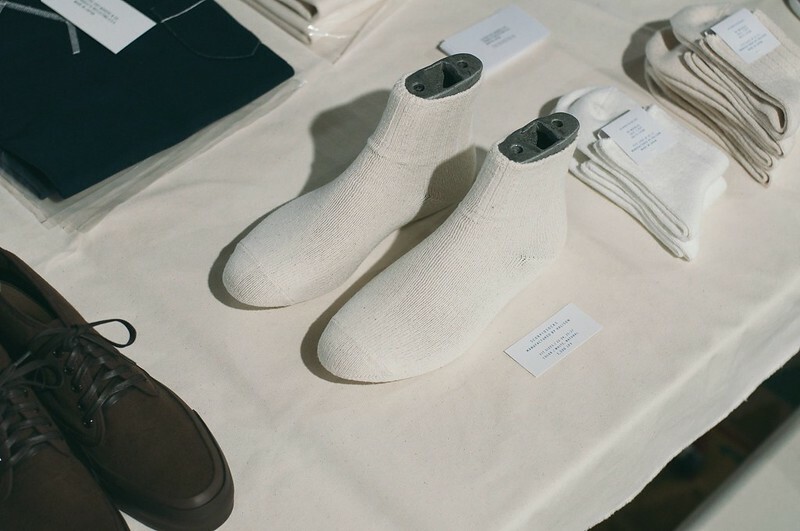 WE'VE EXAMINED THE COMPATIBILITY BETWEEN THE CANVAS SHOES AND COTTON SOCKS AT THE PRESENT TIME AND LEARNED THE FUNCTION AND NECESSITY OF CARE FROM TECHNICAL EXPERTS OF HALISON. WITH THE STEADY TRUST AND SERVICE, AND PHILOSOPHY ACCUMULATED OVER TIME, OUR IDEAL CASUAL SOCKS HAS BEEN BORN.